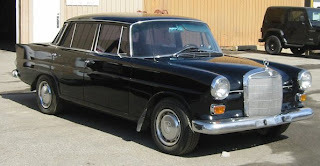 1966 Mercedes-Benz 230 - IF (and when looking at a car online, there's always a big "IF") this car is what the seller says it is, this is a project you could start now and in a few weeks be ready for the summer car shows. This Fintail Mercedes appears to be in very, very nice condition for a 44 year old Vermont car. The seller claims that it has been stored inside for most of its life and, judging by the pictures, that's probably true. The car has not run in 5 years. There is no mention of how it ran prior to being parked, but the seller says it's "mechanically sound". The asking price for this car is a reasonable $1250.00. You may have to put that much again into it in new parts, but still, even $2500.00 is reasonable for a usable classic car. Heck, it's worth $2500.00 just to watch the funky old Mercedes instrument cluster in action! 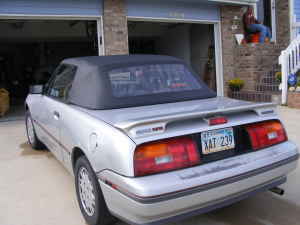 1991 Mercury Capri - This is a car that is better than most people think it is, but not as good as it should have been. Based on the Mazda 323 and built in Australia, this car may have done better in the market had Mazda itself not introduced the Miata a few months earlier. The Mazda was RWD and looked like a classic Lotus. The Capri was FWD and kind of looked like a TR7 that was cross pollinated with a Reliant Scimitar SS1 and a Buick Reatta. Sort of. Maybe. I don't know. Whatever, versus the Miata, the Capri never had a chance. There is really only one Capri to own and that's this one; a turbo with a 5 speed. With 132 HP on tap it's actually a pretty fun car to drive. The best part about a Capri is the price. This one appears to be in great shape and is selling for top (Capri) dollar... $2500.00. If you're looking for a throw-away summer car, you can find plenty of decent Capris for under $2K. Located in Kansas City, MO, click here to see the Craigslist ad.